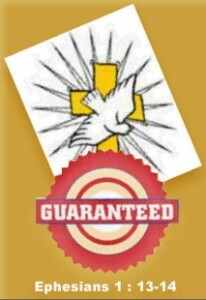 Believers are marked–sealed–guaranteed–a place in heaven. God has reserved a place for them–Jesus has paid for it—and the Holy Spirit has guaranteed it. All Believers need do is believe it–claim it –and live in the joyful hope ! Believers, let’s go forth today praising God for this inheritance we have received in Christ! Wow! Isn’t that a reason to rejoice today? what a wonderful promise this is! I shall rejoice daily knowing that I am sealed with Your Holy Spirit and guaranteed a place in heaven because of my faith in Jesus. Thank You, God, for not only providing a place in eternity with You forever, but also placing Your Holy Spirit within me, which allows me to have an abundant life here on earth too. For all this I rejoice and give You thanks and praise for Your great mercy! God, please help me to be able to tell others about this great promise, so they too can receive the inheritance You want to give to all.